Long-term administration of cyclosporine (CsA) has been shown to cause hypercholesteremia, hypertriglyceridemia, and elevations of plasma low-density and very low-density lipoprotein (LDL and VLDL) levels in humans. This study was undertaken to explore the effects of CsA on expressions of the key lipid regulatory enzymes and receptors. Thus, hepatic expressions of cholesterol 7α-hydroxylase (the rate-limiting step in cholesterol conversion to bile acids), LDL receptor, and high-density lipoprotein (HDL) receptor proteins, as well as 3-hydroxy-3-methylglutaryl coenzyme A (HMG-CoA) reductase activity were determined in rats treated with CsA (18 mg/kg/day) or placebo for 3 weeks. In addition, skeletal muscle and adipose tissue expressions of lipoprotein lipase and VLDL receptor were measured. Western blot analysis was used for all protein measurements using appropriate antibodies against the respective proteins. CsA-treated animals showed mild but significant elevations of plasma cholesterol and triglyceride concentrations. This was associated with a marked down-regulation of cholesterol 7α-hydroxylase in the liver and a severe reduction of lipoprotein lipase abundance in skeletal muscle and adipose tissue. However, hepatic LDL receptor and HDL receptor expressions and HMG-CoA reductase activity were not altered by CsA therapy. Likewise, skeletal muscle and adipose tissue VLDL receptor protein expressions were unaffected by CsA administration under the given condition. In conclusion, CsA administration for 3 weeks resulted in a significant reduction of hepatic cholesterol 7α-hydroxylase and marked down-regulation of skeletal muscle and adipose tissue lipoprotein lipase abundance in rats. The former abnormality can contribute to hypercholesterolemia by limiting cholesterol catabolism, whereas the latter may contribute to hypertriglyceridemia and VLDL accumulation by limiting triglyceride-rich lipoprotein clearance in CsA-treated animals. Since its introduction and release as an anti-rejection agent two decades ago, cyclosporine (CsA) has become the cornerstone of immunosuppressive therapy in organ transplant recipients. Administration of CsA is accompanied by a variety of side effects, including hypertension, nephrotoxicity, microvascular thrombosis, and hyperlipidemia. Long-term administration of CsA has been reported to raise plasma total cholesterol and triglyceride concentrations and to increase plasma low-density lipoprotein (LDL) and very low-density lipoprotein (VLDL) levels in humans (Raine et al., 1988; Ballantyne et al., 1989; Drueke et al., 1991; Schorn et al., 1991; Webb et al., 1992; Kuster et al., 1994; Edwards et al., 1995; Verpooten et al., 1996). Moreover, CsA administration enhances generation of oxygen-free radicals leading to oxidation of lipoproteins and formation of proatherogenic oxidized LDL (Lopez-Miranda et al., 1993; Sutherland et al., 1995). It should be noted, however, that the residual renal insufficiency and concomitant administration of corticosteroids, diuretics, and beta blockers, which are commonly used in transplant recipients, can independently affect lipid metabolism. For instance, Arnadottir et al. (1991)reported a significant elevation of serum cholesterol and triglyceride concentrations in their transplant recipients treated with CsA, compared with the non-CsA-treated group. However, their CsA-treated group had a greater impairment of renal function, received a higher corticosteroid dosage, and were more frequently treated with diuretics and beta blockers. Moreover, multiple regression analysis failed to demonstrate a clear association between CsA administration and hyperlipidemia in the latter study (Arnadottir et al., 1991). Thus, the presence of multiple confounding factors in the clinical setting hinders the ability to draw definitive conclusions as to the direct role of CsA in the pathogenesis of the associated dyslipidemia. Available data on the mechanisms of CsA-induced dyslipidemia are limited. We considered that a systematic study of the key lipid-regulatory factors might help to uncover the molecular basis of CsA-induced hyperlipidemia. To this end, we explored the effect of CsA therapy on hepatic 3-hydroxy-3-methylglutaryl coenzyme A (HMG-CoA) reductase (the rate-limiting enzyme in cholesterol synthesis), LDL, and high-density lipoprotein (HDL) receptors (the critical factors in metabolism of the cholesterol-rich LDL and HDL particles), and of cholesterol 7α-hydroxylase, (the rate-limiting step in cholesterol catabolism to bile acids). In addition, we determined the effects of CsA therapy on skeletal muscle and adipose tissue abundance of lipoprotein lipase and the novel VLDL receptor, which are the principal clearance pathways of triglyceride-rich lipoproteins, namely, chylomicrons and VLDL. Male Sprague-Dawley rats with an average body weight of 240 g were randomized into CsA- and placebo-treated control groups (n = 6 in each group). The animals were housed in a climate-controlled light-regulated space with 12-h light (>500 lux) and dark (<5 lux) cycles. They were fed regular rat chow and water ad libitum. Animals assigned to the CsA group were given a daily dose of CsA (18 mg/kg; Sigma Chemical Inc., St. Louis, MO) dissolved in olive oil by gastric gavage. The control group received the vehicle (olive oil) alone. Treatments were continued for 3 weeks. At the conclusion of the study period, animals were placed in individual metabolic cages for timed urine collections. Under general anesthesia (i.p. injection of Nembutal, 50 mg/kg), liver, soleus muscle, and supratesticular fat were harvested, and the animals were euthanized by exsanguination. The tissues were immediately frozen in liquid nitrogen and stored at −70°C until processed. Serum total cholesterol and triglyceride levels were measured using standard laboratory methods. The CsA dosage used here was similar to that used in our earlier studies of this model (Vaziri et al., 1998) and substantially lower than the 25- to 60-mg/kg/day dosage used by other investigators in the rat (Takenaka et al., 1992; Roullet et al., 1994; Oriji and Keiser, 1998). This was intended to minimize CsA-induced toxicity in the study animals. Western blot analysis was used to determine the abundance of the following receptors and enzymes in the test tissues. Hepatic tissue LDL receptor abundance was measured in plasma membrane preparation by Western blot using mouse anti-LDL receptor antibody (Cortex Biochem Inc., Davis, CA) in a manner precisely the same as that described in our earlier study (Vaziri and Liang, 1996b). Hepatic tissue HDL receptor abundance was determined in the liver tissue protein preparation by Western blot using a polyclonal HDL receptor antibody (Novus Biological Inc., Littleton, CO) as described in our earlier study (Liang and Vaziri, 1999). Skeletal muscle and adipose tissue VLDL receptor expressions were quantified by Western blot analysis using a monoclonal antibody derived in our laboratory from the IgG-GAG hybridoma cell line in a manner which was identical with that described in our previous study (Vaziri and Liang, 1997). Cholesterol 7α-hydroxylase protein mass was determined in hepatic tissue microsomal preparation by Western blot using a rabbit anti-rat cholesterol 7α-hydroxylase antibody (a generous gift from Professor John Y. L. Chiang, Northwestern Ohio University) in a manner described in our previous study (Liang et al., 1996). 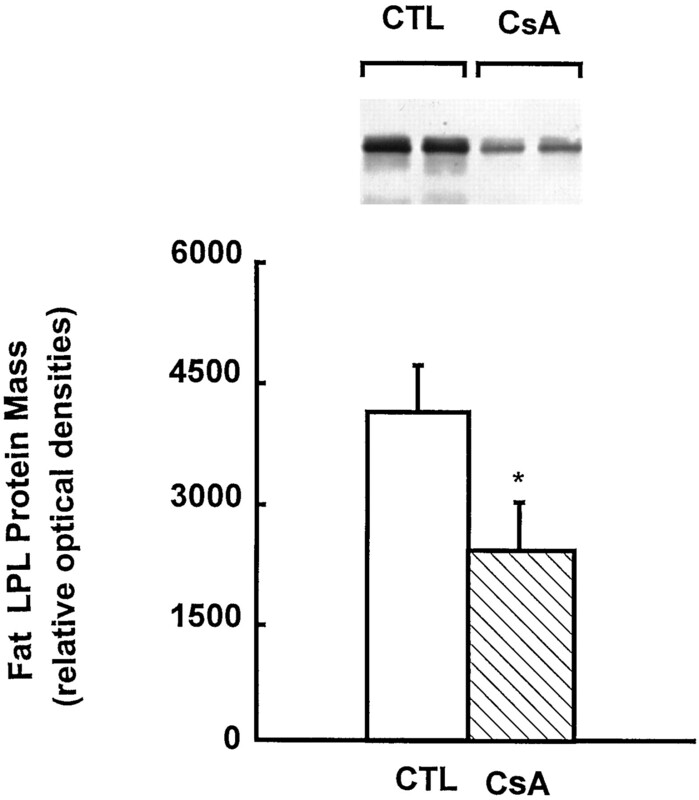 Lipoprotein lipase protein abundance was determined in skeletal muscle and fat tissue preparations by Western blot using a mouse anti-bovine lipoprotein lipase antibody (a gift from Professor John Brunzell, University of Washington) as described in our earlier study (Vaziri et al., 1997). HMG-CoA reductase enzymatic activity of the liver tissue was determined using the procedures described in our earlier studies (Vaziri and Liang, 1995). Free cholesterol concentration in the liver tissue was determined as described in our earlier studies (Vaziri and Liang, 1995). Student's t test was used in statistical analysis of the data that are presented as mean ± S.E. P values less than .05 were considered significant. 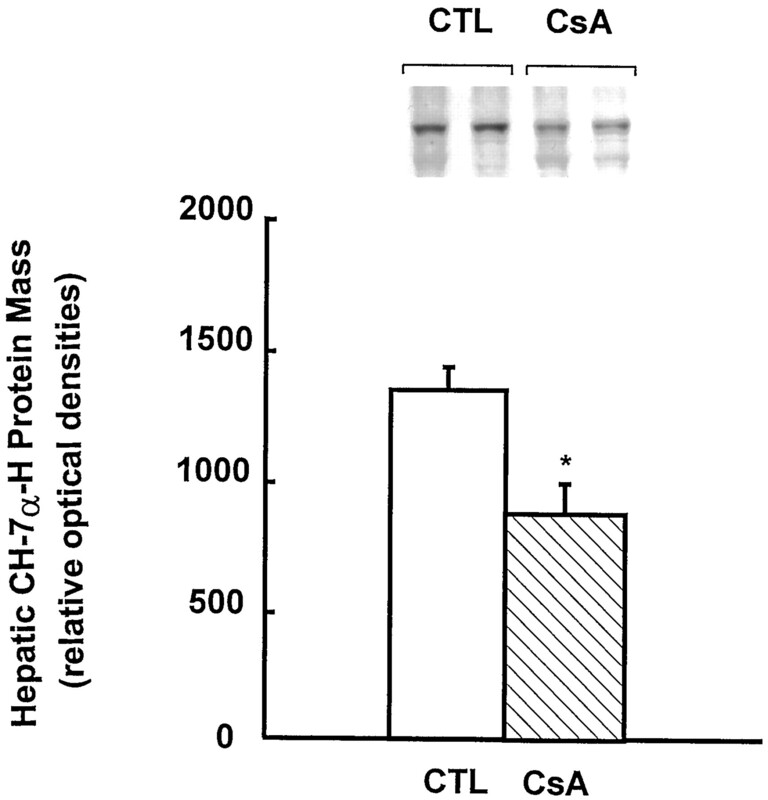 The CsA-treated group exhibited a significant reduction in hepatic cholesterol 7α-hydroxylase protein abundance compared with that in the placebo-treated control rats (P < .002) (Fig.1). However, hepatic HMG-CoA reductase activity was comparable in the two groups (4.0 ± 0.1 versus 3.8 ± 0.3 nmol/min/mg of protein in the CsA and control groups, respectively, P = NS). No significant difference was found in liver LDL receptor protein abundance between the two groups (Fig. 2). Likewise, hepatic tissue HDL receptor protein mass was comparable in the two groups (Fig.3). In comparison with the control group, the CsA-treated rats showed a marked down-regulation of lipoprotein lipase protein abundance in the adipose tissue (P < .001) (Fig. 4). 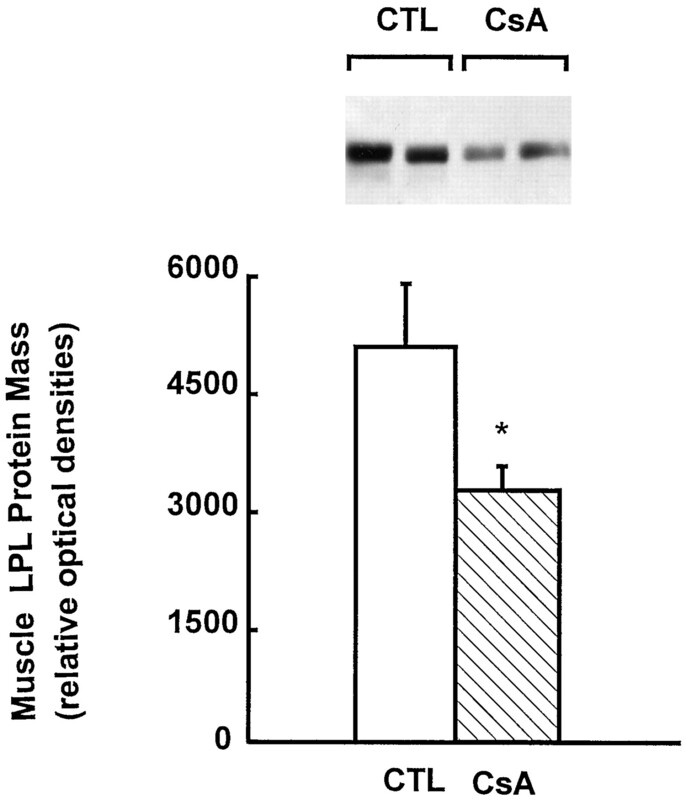 Similarly, lipoprotein lipase protein expression was significantly reduced in the skeletal muscle of the CsA-treated rats (P < .001) (Fig.5). However, no significant difference was observed in adipose tissue VLDL receptor protein expression between the CsA- and placebo-treated rats (Fig.6). Likewise, CsA therapy did not significantly affect VLDL receptor protein expression in skeletal muscle (Fig. 7). Interestingly, free cholesterol concentration in the liver tissue was significantly lower in the CsA-treated group compared with the control group (3.7 ± 0.3 versus 5.5 ± 0.7 mg/g of wet tissue, P < .04). No significant difference was found in creatinine clearance between the CsA-treated rats (1.43 ± 0.1 ml/min) and the placebo-treated control animals (1.43 ± 0.1 ml/min). Representative Western blot and group data depicting hepatic LDL receptor (LDL-R) protein abundance in the CsA-treated and control groups. n = 6 in each group. Representative Western blot and group data depicting HDL receptor (HDL-R) protein abundance in the CsA-treated and control groups. n = 6 in each group. 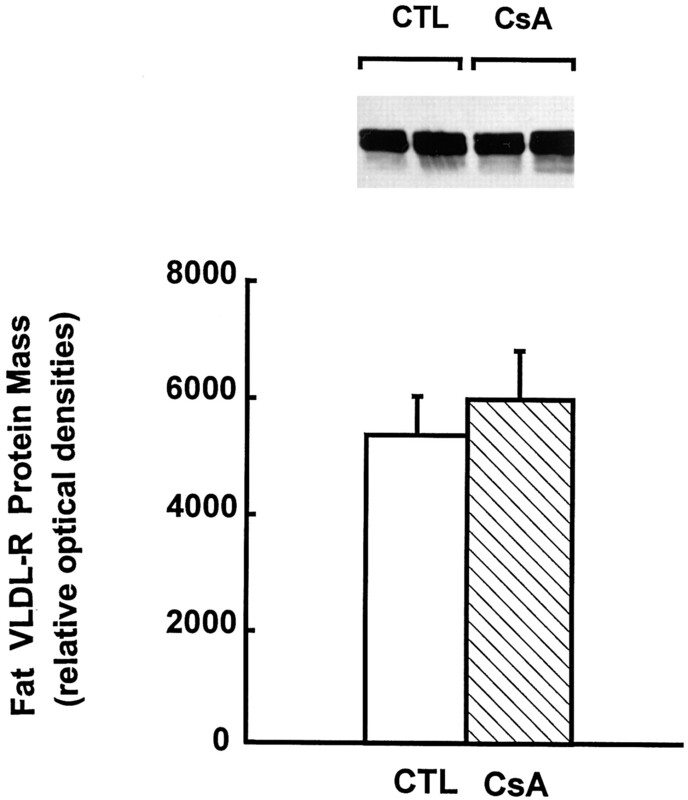 Representative Western blot and group data illustrating adipose tissue VLDL receptor (VLDL-R) protein abundance in the CsA-treated and control groups. n = 6 in each group. 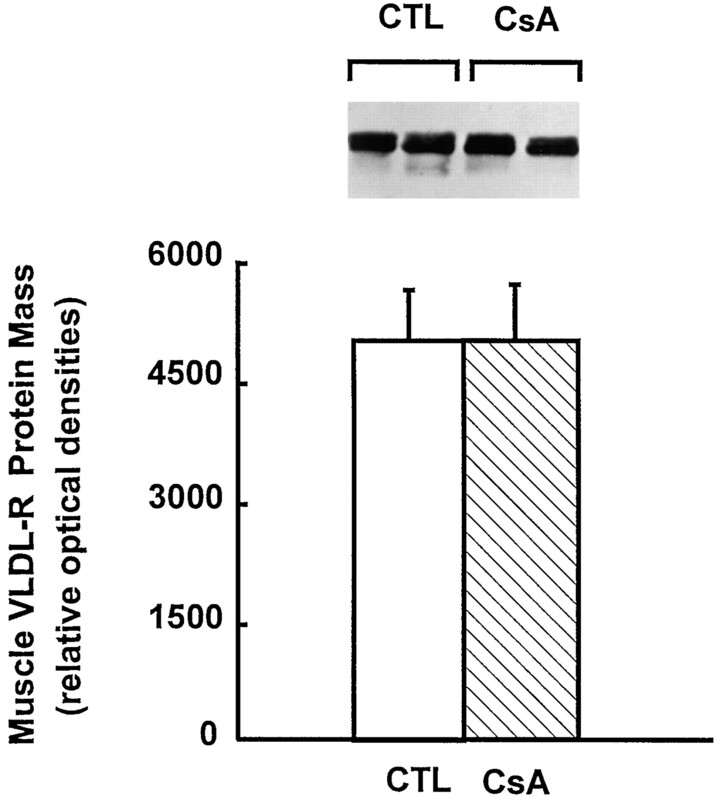 Representative Western blot and group data illustrating skeletal muscle VLDL receptor (VLDL-R) protein abundance in the CsA-treated and control groups. n = 6 in each group. The CsA-treated group showed a mild but significant elevation of serum total cholesterol concentration compared with the control group (77.5 ± 4.2 versus 61.9 ± 1.7 mg/dl, P < .01). Likewise, serum triglyceride level was higher in the CsA-treated animals than the corresponding value found in the control group (50.9 ± 2.0 versus 42.5 ± 2.6 mg/dl, P < .05). CsA-treated animals showed a significant reduction in hepatic tissue abundance of cholesterol 7α-hydroxylase. This enzyme is the rate-limiting step in cholesterol conversion to bile acid, which is the principal pathway of cholesterol catabolism. Therefore, its down-regulation by CsA therapy can potentially contribute to elevation of cholesterol level. In an earlier study, Princen et al. (1991)demonstrated that CsA blocks bile acid synthesis by cultured hepatocytes in vitro. Down-regulation of hepatic cholesterol 7α-hydroxylase shown in the CsA-treated animals here provides the molecular basis of the in vitro studies by Princen et al. (1991). Intracellular concentration of free cholesterol exerts a direct regulatory role on hepatic cholesterol 7α-hydroxylase expression in the liver (Russell and Setchell, 1992). Down-regulation of cholesterol 7α-hydroxylase found in our CsA-treated animals may be due to depressed intracellular free cholesterol concentration noted in these animals. In contrast to cholesterol 7α-hydroxylase, hepatic HMG-CoA reductase activity was not affected by CsA therapy in the rats used in this study. Because HMG-CoA reductase is the rate-limiting step in cholesterol synthesis, its normality in the CsA-treated animals suggests that the associated rise in serum cholesterol is probably not due to enhanced hepatic cholesterol synthesis. Under normal conditions, as much as 80% of the circulating LDL particles are cleared by the liver primarily through an LDL receptor-mediated process (Dietschy, 1995). Thus, LDL receptor plays an important role in LDL metabolism. Based on these observations, we considered that the reported elevation of LDL cholesterol with CsA therapy could be due to an acquired LDL receptor deficiency. However, the results of this study revealed no discernible reduction in hepatic LDL receptor protein abundance in the CsA-treated animals. 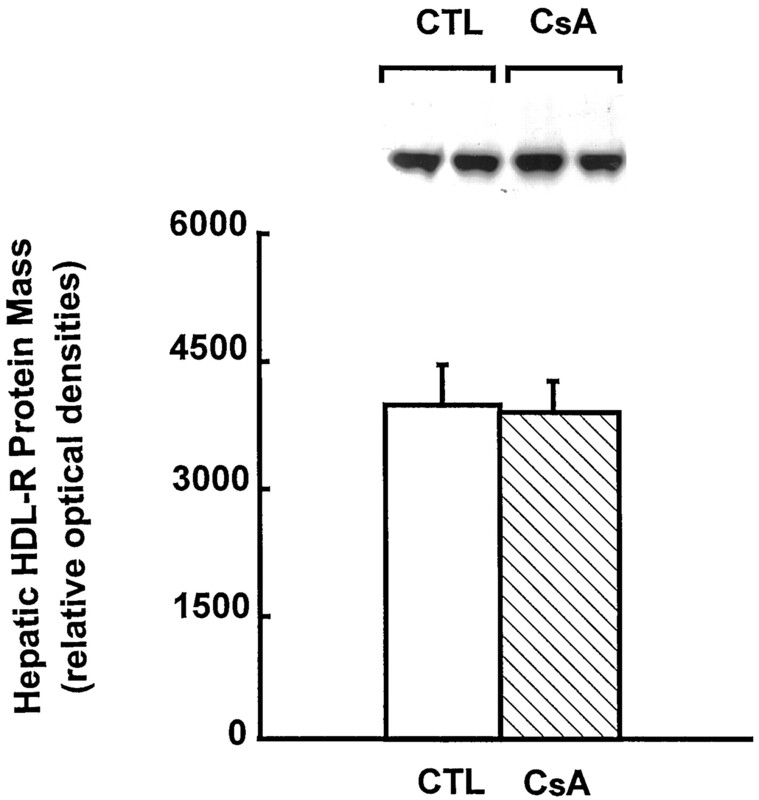 Thus, CsA administration at the given dosage for 3 weeks did not alter hepatic LDL receptor protein mass in the rats. This observation excluded a quantitative LDL receptor deficiency in this model. It should be noted, however, that this study did not examine the functional integrity of LDL receptor and its binding affinity for LDL and, as such, cannot exclude possible receptor dysfunction. LDL clearance by its receptor requires LDL-LDL receptor binding. Thus, the rate of LDL clearance by the liver is a function of LDL receptor abundance and the binding affinity of LDL for its receptor. CsA therapy is associated with increased generation of oxygen-free radicals leading to production of oxidized LDL (Apanay et al., 1994; Sutherland et al., 1995). Compared with the intact LDL, oxidized LDL particles have a significantly lower binding affinity for LDL receptor. It is, therefore, conceivable that the receptor-mediated LDL uptake may be reduced despite normal LDL receptor abundance in CsA-treated animals. Likewise, CsA may directly bind to LDL particles and potentially alter their composition and binding affinity. The available data do not allow any conclusion with regards to the possible effects of CsA on either LDL receptor or LDL structure or function. Additional studies are needed to address these possibilities. In contrast to this in vivo study demonstrating no significant decrease in LDL receptor abundance, Rayyes et al. (1996) have shown marked down-regulation of LDL receptor expression in CsA-treated HepG2 cells in vitro. The reason for the difference between the latter in vitro study and this in vivo study is not clear. It should be noted that intracellular free cholesterol concentration exerts a negative feedback influence on hepatic LDL receptor expression (Cooper, 1989). Despite the significant reduction in intracellular free cholesterol concentration, hepatic LDL receptor failed to rise in the CsA-treated group, thus reflecting a relative deficiency state. Moreover, despite elevation of serum cholesterol concentration and normality of HMG-CoA reductase, cholesterol concentration in the hepatocyte was reduced. This phenomenon points to a possible impairment of the receptor-mediated cholesterol uptake by the liver. HDL particles serve as carriers of cholesterol from peripheral tissues to the liver. The HDL-mediated reverse cholesterol transport plays a major role in the cardiovascular protection against arteriosclerotic cardiovascular disease. Cholesterol unloading in the liver by HDL particles depends on the availability of the newly discovered hepatic HDL receptor (Acton et al., 1996). Cholesterol-rich HDL particles transiently bind to HDL receptor, which facilitates transport of cholesterol esters from HDL to hepatocytes. In addition, HDL receptor facilitates the hydrolysis of HDL-borne triglycerides by hepatic lipase and fatty acid uptake by hepatocytes. Once lipid unloading has occurred, the lipid-depleted HDL particle dissociates from the receptor to repeat the cycle (Acton et al., 1996). We have recently demonstrated a marked down-regulation of hepatic HDL receptor protein expression in nephrotic syndrome (Liang and Vaziri, 1999). By limiting the HDL-mediated reverse cholesterol transport, HDL receptor deficiency can potentially contribute to arteriosclerotic vascular disease. Because chronic CsA administration can result in vasculopathy, we wondered whether CsA therapy affects HDL receptor abundance. The results of this study showed no significant difference in hepatic HDL receptor protein expression between the CsA- and vehicle-treated control rats. This observation excluded a quantitative HDL receptor deficiency in CsA-treated rats under the given experimental conditions. However, the available data do not allow any conclusion about the receptor function and the receptor ligand interaction, which await future investigations. Lipoprotein lipase is expressed in a variety of tissues, most notably skeletal muscle, myocardium, and adipose tissue. In the presence of its cofactor, apolipoprotein C-II, lipoprotein lipase hydrolyzes triglycerides contained in the triglyceride-rich lipoproteins, namely, VLDL and chylomicrons. This results in the release of free fatty acids that are taken up by myocytes for energy production or by adipocytes for energy storage. Moreover, lipolytic action of lipoprotein lipase transforms VLDL to intermediate-density lipoprotein (IDL) and chylomicron to chylomicron remnants that undergo further transformation and eventual uptake through LDL receptor or LDL receptor-related protein pathways. Inherited lipoprotein lipase deficiency is associated with hypertriglyceridemia and impaired chylomicron and VLDL clearance, as well as triglyceride enrichment of various lipoproteins. We have recently shown marked down-regulation of lipoprotein lipase in animals with chronic renal failure and nephrotic syndrome, conditions that are associated with hypertriglyceridemia and impaired triglyceride-rich lipoprotein clearance (Vaziri and Liang, 1996a; Liang and Vaziri, 1997b). We, therefore, considered that hypertriglyceridemia and elevated VLDL concentration known to occur in CsA-treated patients (Raine et al., 1988; Ballantyne et al., 1989;Drueke et al., 1991; Schorn et al., 1991; Webb et al., 1992; Kuster et al., 1994; Edwards et al., 1995; Verpooten et al., 1996; Verzola et al., 1999) may be, in part, due to lipoprotein lipase deficiency. The results of this study showed marked reductions of both skeletal muscle and adipose tissue lipoprotein lipase abundance in CsA-treated rats, thus supporting our original hypothesis. Because lipoprotein lipase is a major pathway for fatty acid uptake by myocytes and adipocytes, its deficiency in CsA-treated subjects impacts not only plasma lipoprotein metabolism but also energy production and storage capacity. As noted earlier, chronic renal failure is associated with lipoprotein lipase deficiency (Liang and Vaziri 1997a; Vaziri et al., 1997). However, the CsA-treated animals used here did not have renal insufficiency as evidenced by normal creatinine clearance values. Thus, the observed lipoprotein lipase deficiency in our CsA-treated animals was not due to renal failure. Discovery of the VLDL receptor several years ago unraveled a previously unknown pathway of VLDL clearance (Takahashi et al., 1992). The VLDL receptor belongs to the large LDL receptor gene family with distinctly different ligand specificity and tissue distribution compared with LDL receptor. For instance, the VLDL receptor binds and internalizes triglyceride-rich VLDL and IDL but not LDL particles. Moreover, it is primarily expressed in skeletal muscle, myocardium, and adipose tissue (Takahashi et al., 1992; Jokinen et al., 1994), whereas LDL receptor is expressed in the liver, steroidogenic glands, and other tissues. We have recently found marked down-regulation of VLDL receptor expression in rats with chronic renal failure (Vaziri and Liang, 1997) and nephrotic syndrome (Liang and Vaziri, 1997a), conditions that are marked by hypertriglyceridemia and elevated VLDL levels. Based on these considerations, we asked whether or not the reported CsA-induced elevation of triglyceride and VLDL levels is associated with VLDL receptor deficiency. The study revealed no discernible difference in VLDL receptor protein abundance in either the skeletal muscle or adipose tissue between the CsA-treated and control groups. Thus, CsA administration in rats under the given conditions does not lead to quantitative modification of VLDL receptor protein expression. It should be noted that lipoprotein lipase and apolipoprotein E have been shown to significantly enhance VLDL receptor activity, whereas heparinase has been shown to depress VLDL receptor activity (Takahashi et al., 1995). Thus, lipoprotein lipase appears to enhance VLDL and IDL binding to the VLDL receptor by forming a bridge between these apolipoprotein E-containing lipoproteins and heparin sulfate proteoglycans and by proteolytic modification of these particles (Takahashi et al., 1995). In view of the regulatory action of lipoprotein lipase on VLDL receptor activity, it is reasonable to assume that although CsA does not change VLDL receptor abundance, it can potentially depress its functional activity through induction of lipoprotein lipase deficiency. In conclusion, administration of CsA to rats for 3 weeks resulted in significant down-regulation of hepatic cholesterol 7α-hydroxylase, the rate-limiting step in cholesterol conversion to bile acids. In addition, CsA therapy resulted in marked down-regulation of skeletal muscle and adipose tissue lipoprotein lipase expression. If true in humans, the latter abnormality can potentially contribute to hypertriglyceridemia and elevation of VLDL level, whereas the former can contribute to hypercholesterolemia in CsA-treated patients. ↵1 This study was generously supported by Mr. and Mrs. William Chou. (1996) Identification of scavenger receptor SR-BI as a high density lipoprotein receptor. Science (Wash DC) 271:518–520. (1994) Cyclosporine increases the oxidizability of low-density lipoproteins in renal transplant recipients. Transplantation (Baltimore) 58:663–669. (1991) Lipoprotein levels and post-heparin lipase activities in kidney transplant recipients: Ciclosporin- versus non-ciclosporin-treated patients. Am J Nephrol 11:391–396. (1989) Effects of cyclosporine therapy on plasma lipoprotein levels. J Am Med Assoc 262:53–56. (1989) Hepatic lipoprotein and cholesterol metabolism. in Hepatology, eds Zakin D, Boyer T (WB Saunders, Philadelphia), pp 105–137. (1995) Experimental mechanism: Regulation of plasma LDL cholesterol. Am J Clin Nutr 62:679S–688S. (1991) Atherosclerosis and lipid disorders after renal transplantation. Kidney Int Suppl 31:S24–S28. (1995) Effect of low-dose cyclosporin on plasma lipoproteins and markers of cholestasis in patients with psoriasis. QJM 88:109–113. (1994) Regulation of the very low density lipoprotein receptor by thyroid hormone in rat skeletal muscle. J Biol Chem 269:26411–26418. (1994) Relation of cyclosporine blood levels to adverse effects on lipoproteins. Transplantation (Baltimore) 57:1479–1483. (1997a) Acquired VLDL receptor deficiency in experimental nephrosis. Kidney Int 51:1761–1765. (1997b) Gene expression of lipoprotein lipase in experimental nephrosis. J Lab Clin Med 130:387–394. (1999) Down-regulation of hepatic high-density lipoprotein receptor, SR-B1, in nephrotic syndrome. Kidney Int 56:621–626. (1996) Gene expression of hepatic cholesterol 7 alpha-hydroxylase in the course of puromycin-induced nephrosis. Kidney Int 49:855–860. (1993) Low-density lipoprotein metabolism in rats treated with cyclosporine. Metabolism 42:678–683. (1998) Role of nitric oxide in cyclosporine A-induced hypertension. Hypertension 32:849–855. (1991) Cyclosporin A blocks bile acid synthesis in cultured hepatocytes by specific inhibition of chenodeoxycholic acid synthesis. Biochem J 275:501–505. (1988) Adverse effect of cyclosporin on plasma cholesterol in renal transplant recipients. Nephrol Dial Transplant 3:458–463. (1996) Cyclosporine inhibits catabolism of low-density lipoproteins in HepG2 cells by about 25%. Hepatology 24:613–619. (1994) Vascular mechanisms of cyclosporin-induced hypertension in the rat. J Clin Invest 93:2244–2250. (1992) Bile acid biosynthesis. Biochemistry 31:4737–4749. (1991) Impact of long-term immunosuppression with cyclosporin A on serum lipids in stable renal transplant recipients. Transpl Int 4:92–95. (1995) Oxidation of low density lipoproteins from patients with renal failure or renal transplants. Kidney Int 48:227–236. (1992) Rabbit very low density lipoprotein receptor: A low density lipoprotein receptor-like protein with distinct ligand specificity. Proc Natl Acad Sci USA 89:9252–9256. (1995) Enhancement of the binding of triglyceride-rich lipoproteins to the very low density lipoprotein receptor by apolipoprotein E and lipoprotein lipase. J Biol Chem 270:15747–15754. (1992) Diminished acetylcholine-induced vasodilation in renal microvessels of cyclosporine-treated rats. J Am Soc Nephrol 3:42–50. (1995) Hepatic HMG-CoA reductase gene expression during the course of puromycin-induced nephrosis. Kidney Int 48:1979–1985. (1996a) Down-regulation of tissue lipoprotein lipase expression in experimental chronic renal failure. Kidney Int 50:1928–1935. 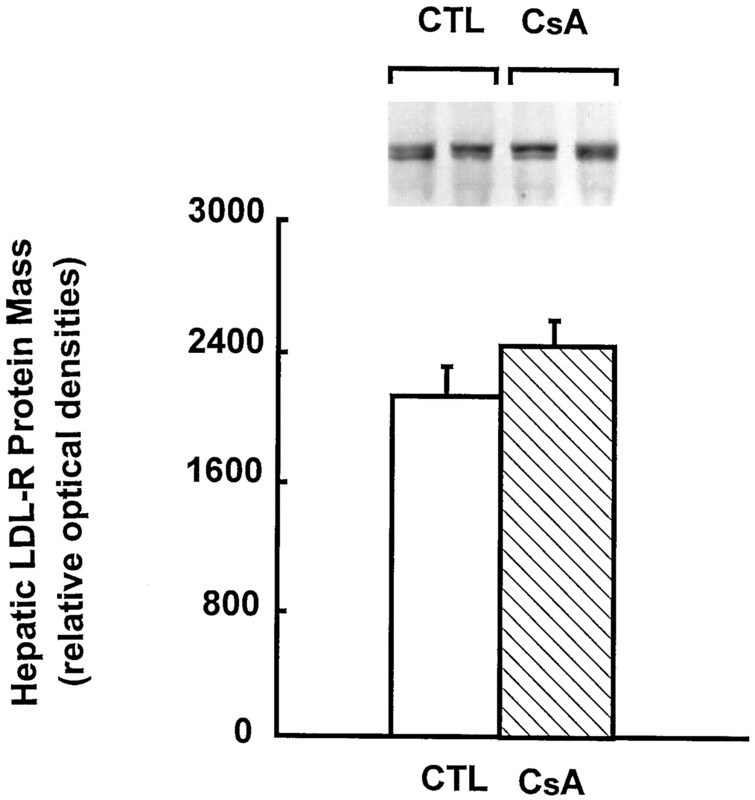 (1996b) Down-regulation of hepatic LDL receptor expression in experimental nephrosis. Kidney Int 50:887–893. (1997) Down-regulation of VLDL receptor expression in chronic experimental renal failure. Kidney Int 51:913–919. (1998) Depressed renal and vascular nitric oxide synthase expression in cyclosporine-induced hypertension. Kidney Int 54:482–491. (1997) Secondary hyperparathyroidism downregulates lipoprotein lipase expression in chronic renal failure. Am J Physiol 273:F925–F930. (1996) Elevated plasminogen activator inhibitor levels in cyclosporin-treated renal allograft recipients. Nephrol Dial Transplant 11:347–351. (1999) Effect of ciclosporin on triglyceridemia in long-term renal transplant recipients. Nephron 81:240–241. (1992) Lipid and lipoprotein (a) concentrations in renal transplant patients. Nephrol Dial Transplant 7:636–641.